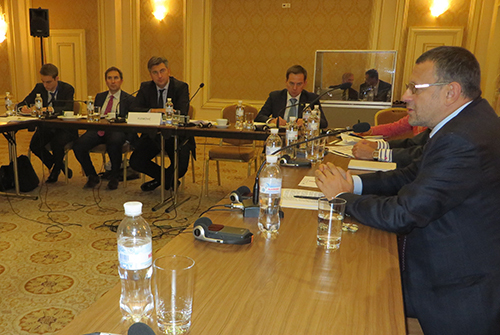 The MPs visited Kyiv, Cherkasy, Odesa, Kharkiv and DnipropetrovskThe delegation, which is integrated in OSCE’s International Election Observation Mission, is led by Croatian MEP Andrej Plenkovic. The parliamentarians had a number of meetings with the Ukranian electoral authorities, the main political actors, parties, civil society, media representatives and relevant EU and international actors. EUAM Head of Mission Kalman Mizsei was invited by the EP delegation to give an update on the EUAM mandate and the challenges the mission has to address. “EUAM currently is fully engaged in the required EU Common Security and Defense Policy (CSDP) planning dynamics. We expect the mission’s official launch for early December”, said Mizsei. supporting the Ukrainian authorities in delivering clear messages to the public regarding the nature and implementation of the reform. EUAM whose headquarter is located in Kyiv also will reach out to the regions. The mission that has an initial two year advisory, non-executive, civilian and unarmed mandate intends to work closely imbedded alongside its Ukrainian counterparts, local ownership being a key element to a positive outcome.